Thomas Keller’s Fried Chicken is legendary. To some, it starts with a pilgrimage to Ad Hoc culminating in a religious experience. To others it’s a family cook-off or quest for perfection, perhaps. But overwhelmingly, Keller’s Fried Chicken is the de facto standard… the supermodel of fried American fare! 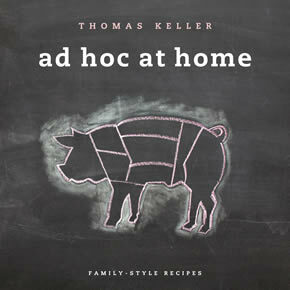 Thanks to Artisan Books, I am excited to share Chef Thomas Keller’s recipe from the Ad Hoc at Home Cookbook! You can purchase your very own copy of Ad Hoc at Home here. And watch an exclusive interview with Thomas Keller from the 28th American Wine & Food Festival here. Directions: Cut each chicken into 10 pieces: 2 legs, 2 thighs, 4 breast quarters, and 2 wings. Pour the brine (recipe included at end of post) into a container large enough to hold the chicken pieces, add in the chicken, and refrigerate for 12 hours (no longer, or the chicken may become too salty). Carefully lower the thighs into the hot oil. Adjust the heat as necessary to return the oil to the proper temperature. Fry for 2 minutes, then carefully move the chicken pieces around in the oil and continue to fry, monitoring the oil temperature and turning the pieces as necessary for even cooking, for 11 to 12 minutes, until the chicken is a deep golden brown, cooked through, and very crisp. Meanwhile, coat the chicken drumsticks and transfer to the parchment-lined baking sheet. Note: We let the chicken rest for 7 to 10 minutes after it comes out of the fryer so that it has a chance to cool down. If the chicken has rested for longer than 10 minutes, put the tray of chicken in a 400°F oven for a minute or two to ensure that the crust is crisp and the chicken is hot. Directions: Combine all the ingredients in a large pot, cover, and bring to a boil. Boil for 1 minute, stirring to dissolve the salt. Remove from the heat and cool completely, then chill before using. The brine can be refrigerated for up to 3 days. Makes 2 gallons. this is the best fried chicken i have ever had. thomas keller is a genius. seems like the drive up to yountville would be easier on me than this recipe tho!